While en route to a hospital for skin grafts, Two-Face is captured by gunzels. In the process, he loses his coin. Batman, Robin, and Commissioner Gordon all agree nothing about the escape matches Two-Face’s usual M.O. Two-Face turns up at the club of Little Jonni Infantino. Jonni sprung Two-Face, and in exchange he wants information Two-Face possessed as Gotham’s former District Attorney. The information will help take down one of Jonni’s rivals. 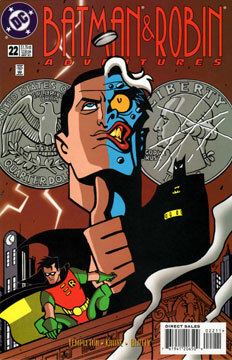 Two-Face scratches a quarter coin, and uses it to make decisions. The answer to Jonni’s request is no. So Jonni leaves to go threaten Two-Face’s former fiancé, Grace Lamont, in an effort to extort the information out of Two-Face. Meanwhile, Batman and Robin consult with Two-Face’s doctor at Arkham, Dr. Sloane. She informs the duo that Two-Face had make progress, and that she didn’t feel Grace or Bruce Wayne would be in danger. She suspects Two-Face was abducted. Back at the club, Two-Face breaks away long enough to call grace and warn her to get out of her apartment. He is quickly recaptured. Grace leaves, and calls her friend Bruce for help. Armed with this new information, Batman and Robin are ready in her apartment when Jonni arrives. They quickly take him and his gang down, and then head to Jonni’s club to find Two-Face. The divided criminal tosses his coin, and sides with his captors during the fight. But when the dynamic duo are vulnerable and a thug threatens to kill them, Two-Face flips his coin again, and this time he saves Batman and Robin, even taking a bullet in the process. Two-Face ultimately reveals the information that would put Jonni’s rival behind bars, before expressing his desire to get his own coin back. I love a good Two-Face story! And this one qualifies nicely. Templeton does a great job of exemplifying the two sides of Harvey Dent’s fractured personality, and his dependence on his coin. I always felt Two-Face worked best as a gangland figure, rather than a freakish rogue. This story is another good example of that. Also, this would have made a great animated episode. Satisfactory. Everything seems to be on-model, if lacking a little energy. I enjoyed it, for the most part. No. This could fit in anytime pre-TNBA. Two-Face in prison garb? Not much else.